After faking their deaths to escape from prison in Article 5, Ember Miller and Chase Jennings have only one goal: to lay low until the Federal Bureau of Reformation forgets they ever existed. I’m glad that i re-read Article 5 since there was so much that i had forgotten. We pick up in this 2nd installment of the series with Ember and Chase trying as best as they can to stay alive with the help of Sean (the guard from the rehabilitation center that she escaped from). They’ve decided that it’s safer and the best choice for now to join up with the resistance since Sean is set on finding Rebecca and Ember feels like he owes it to her to do that. So this story really takes us down both of those paths. Trying to stay alive and trying to find Becca. Ember is the #5 most wanted person in the country because she’s thought to be the infamous sniper, which makes things even harder for her. She and Chase are dealing with the stress of the ‘war’ as well as trying to figure out what they have with each other and if it’s enough to fight for. One familiar face from Book 1 shows up in an unexpected place and we’re not quite sure if we can trust him. Tucker. From what we know of him from Article 5, we assume that he’s on the bad side but is he? he continues to do things to make us believe that he’s not to be trusted but then at times he does things to flip the switch. Through this story, we’re taking through Wayland Inn, to another town, crossing paths with others, hearing tales of the famous Three – and trying all at the same time to stay alive and find becca while maintaining what they all have together. (All being Sean, Chase and Ember). The ending of this story was somewhat expected based on the path that we keep going down, yet i’m not quite sure what to make of it. we are left off at a great ‘breaking point’ so to speak where the final book of the trilogy (i think it’s a trilogy) will really wrap things up and reveal quite a bit. i can’t wait to read more – i wish that the next installment came out sooner. 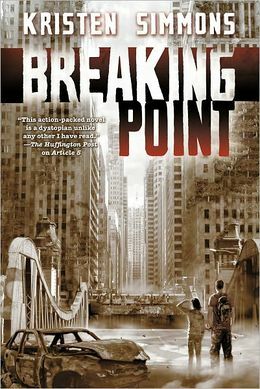 This entry was posted in Dystopian, Reviews and tagged Article 5, Breaking Point, Dystopian, Kristen Simmons by iscm13. Bookmark the permalink.